I’ve been drawing a strip on Bangalore these past few months. Time Out Bengaluru allows me to draw on just about anything that catches my fancy (thank you kindly) without any sort of editorial intervention. Any sort of serious discipline is yet to set in. Every fortnight I get a reminder from my team at the office, and my mind is blank until the very last minute. The past few issues have been getting worse, with me cramming the drawing in a few hours before drop-boxing it to the editor. My drawings have improved slightly over the past few issues though. 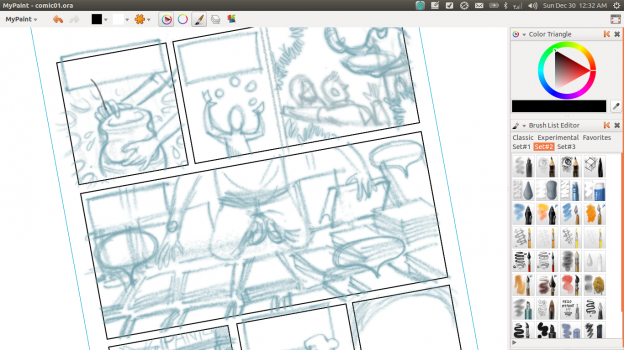 I use the awesome Mypaint for drawing and Inkscape for layouts and text. Mypaint has been steadily getting better over the years. The layers feature allows me to make a rough sketch in blue pencil. I can then Ink and colour in separate layers. This is what the final output looks like. I find street entrepreneurs fascinating. Visit the Pencil Sauce Comics Blog. For what to create things, if there is not love to Krishna inside?